The color correction tools in Final Cut Pro X are nice. Adobe’s Lumetri controls make grading intuitive. But sometimes you just want to click a few buttons and be happy with the results. That’s where AutoGrade from Hawaiki comes in. AutoGrade is a full-featured color correction plug-in that runs within Final Cut Pro X, Motion, Premiere Pro and After Effects. It is available from FxFactory and installs through the FxFactory plug-in manager. As the name implies, AutoGrade is an automatic color correction tool designed to simplify and speed-up color correction. When you install AutoGrade, you get two plug-ins: AutoGrade and AutoGrade One. The latter is a simple, one-button version, based on global white balance. Simply use the color-picker (eye dropper) and sample an area that should be white. Select enable and the overall color balance is corrected. You can then tweak further, by boosting the correction, adjusting the RGB balance sliders, and/or fine-tuning luma level and saturation. Nearly all parameters are keyframeable, and looks can be saved as presets. AutoGrade One is just a starter, though, for simple fixes. The real fun is with the full version of AutoGrade, which is a more comprehensive color correction tool. Its interface is divided into three main sections: Auto Balance, Quick Fix, and Fine-Tune. Instead of a single global balance tool, the Auto Balance section permits global, as well as, any combination of white, black, and/or skin correction. Simply turn on one or more desired parameters, sample the appropriate color(s) and enable Auto Balance. This tool will also raise or lower luma levels for the selected tonal range. Sometimes you might have to repeat the process if you don’t like the first results. For example, when you sample the skin on someone’s face, sampling rosy cheeks will yield different results than if you sample the yellowish highlights on a forehead. To try again, just uncheck Auto Balance, sample a different area, and then enable Auto Balance again. In addition to an amount slider for each correction range, you can also adjust the RGB balance for each. Skin tones may be balanced towards warm or neutral, and the entire image can be legalized, which clamps video levels to 0-100. Quick Fix is a set of supplied presets that work independently of the color balance controls. These include some standards, like cooling down or warming up the image, the orange and teal look, adding an s-curve, and so on. They are applied at 100% and to my eye felt a bit harsh at this default. To tone down the effect, simply adjust the amount slider downwards to get less intensity from the effect. Fine-Tune rounds it out when you need to take a deeper dive. This section is built as a full-blown, 3-way color corrector. Each range includes a luma and three color offset controls. Instead of wheels, these controls are sliders, but the results are the same as with wheels. In addition, you can adjust exposure, saturation, vibrance, temperature/tint, and even two different contrast controls. One innovation is a log expander, designed to make it easy to correct log-encoded camera footage, in the absence of a specific log-to-Rec709 camera LUT. Naturally, any plug-in could always offer more, so I have a minor wish list. I would love to see five additional features: film grain, vignette, sharpening, blurring/soft focus, and a highlights-only expander. There are certainly other individual filters that cover these needs, but having it all within a single plug-in would make sense. This would round out AutoGrade as a complete, creative grading module, servicing user needs beyond just color correction looks. AutoGrade is a deceptively powerful color corrector, hidden under a simple interface. User-created looks can be saved as presets, so you can quickly apply complex settings to similar shots and set-ups. There are already many color correction tools on the market, including Hawaiki’s own Hawaiki Color. The price is very attractive, so AutoGrade is a superb tool to have in your kit. It’s a fast way to color-grade that’s ideal for both users who are new or experienced when it comes to color correction. Prior to version 10.4, the color correction tools within Final Cut Pro X were very basic. 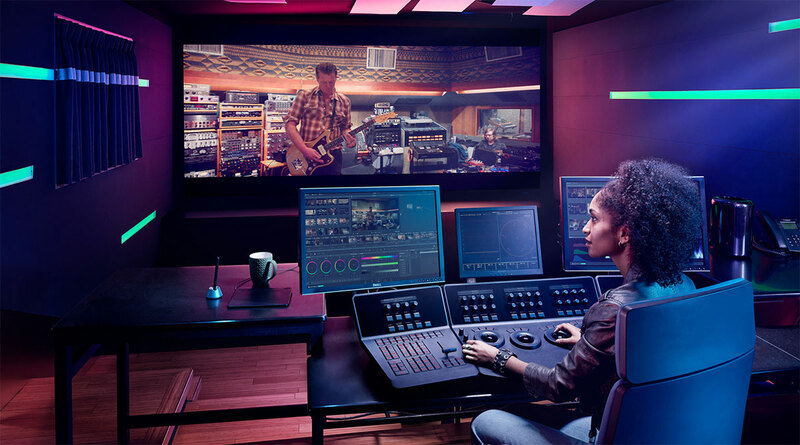 You could get a lot of work done with the color board, but it just didn’t offer tools competitive with other NLEs – not to mention color plug-ins or a dedicated grading app like DaVinci Resolve. With the release of 10.4, Apple upped the game by adding color wheels and a very nice curves implementation. However, for those of us who have been doing color correction for some time, it quickly became apparent that something wasn’t quite right in the math or color science behind these new FCPX color wheels. I described those anomalies in this January post. 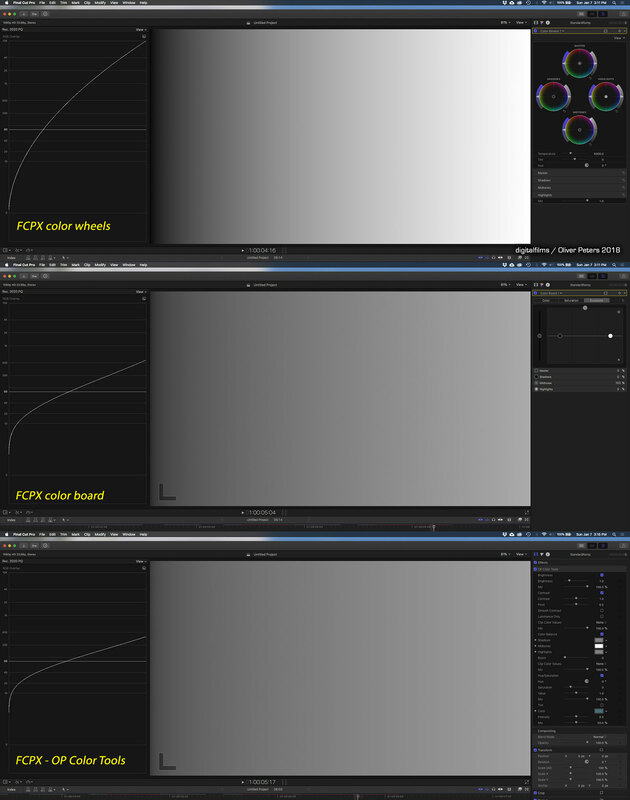 To summarize that post, the color wheels tool seems to have been designed according to the lift/gamma/gain (LGG) correction model. The standard behavior for LGG is evident with a black-to-white gradient image. On a waveform display, this appears as a diagonal line from 0 to 100. If you adjust the highlight control (gain), the line appears to be pinned at the bottom with the higher end pivoting up or down as you shift the slider. Likewise, the shadow control (lift) leaves the line pinned at the top with the bottom half pivoting. The midrange control (gamma) bends the middle section of the line inward or outward, with no affect on the two ends, which stay pinned at 0 and 100, respectively. In addition to luminance value, when you shift the hue offset to an extreme edge – like moving the midrange puck completely to yellow – you should still see some remaining black and white at the two ends of the gradient. That’s how LGG is supposed to work. In FCPX version 10.4, each color wheel control also altered the levels of everything else. When you adjusted midrange, it also elevated the shadow and highlight ranges. In the hue offset example, shifting the midrange control to full-on yellow tinted the entire image to yellow, leaving no hint of black or white. As a result, the color wheels correction tool was unpredictable and difficult to use, unless you were doing only very minor adjustments. You ended up chasing your tail, because when one correction was made, you’d have to go back and re-adjust one of the other wheels to compensate for the unwanted changes made by the first adjustment. With the release of FCPX 10.4.1 this April, Apple engineers have changed the way the color wheels tool behaves. Corrections now correspond to the behavior that everyone accepts as standard LGG functionality. In other words, the controls mostly only affect their part of the image without also adjusting all other levels. This means that the shadows (lift) control adjusts the bottom, highlights (gain) will adjust the top end, and midrange (gamma) will lighten or darken the middle portion of the image. Likewise, hue offsets don’t completely contaminate the entire image. One important thing to note is that existing FCPX Libraries created or promoted under 10.4 will now be promoted again when opened in 10.4.1. In order that your color wheel corrections don’t change to something unexpected when promoted, Projects in these Libraries will behave according to the previous FCPX 10.4 color model. This means that the look of clips where color wheels were used – and their color wheel values – haven’t changed. More importantly, the behavior of the wheels when inside those Libraries will also be according to the “old” way, should you make any further corrections. The new color wheels behavior will only begin within new Libraries created under 10.4.1. These images clarify how the 10.4.1 adjustments now work (click to see enlarged and expanded views). Since its introduction six years ago, Apple Final Cut Pro X has only offered the Color Board as its color correction/grading tool. That’s in addition to some automatic correction features and stylized “look” effects. The Color Board interface is based on color swatches and puck sliders, instead of traditional color wheels, leaving many users pining for something else. 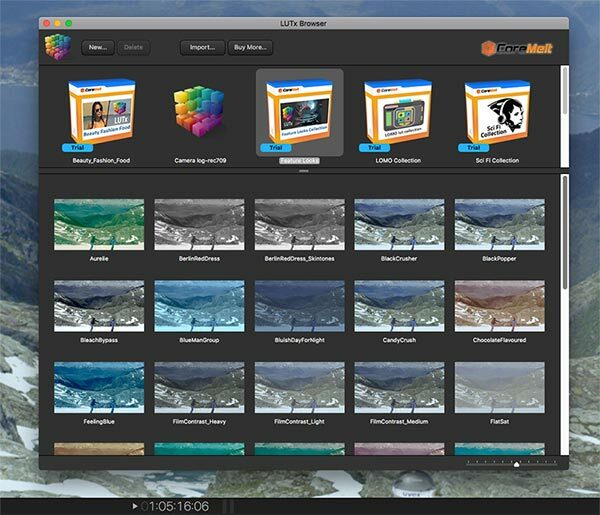 To answer this need, several third-party, plug-in developers have created color corrector effects modules to fill the void. The newest of these is Chromatic from Coremelt – a veteran Final Cut plug-in developer. 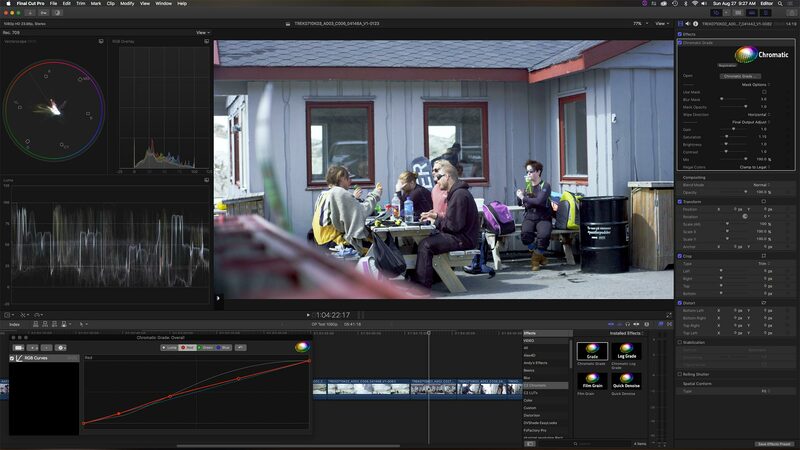 Chromatic is the most feature-rich color correction module currently available for FCPX. It offers four levels of color grading, including inside and/or outside of a mask, overall frame, and also a final output correction. When you first apply the Chromatic Grade effect to a clip, you’ll see controls appear within the FCPX inspector window. These are the final output adjustments. To access the full toolset, you need to click on the Grade icon, which launches a custom UI. Like other grading tools that require custom interfaces, Chromatic’s grading toolset opens as a floating window. This is necessitated by the FCPX architecture, which doesn’t give developers the ability to integrate custom interface panels, like you’ll find in Adobe applications. To work around this limitation, developers have come up with various ingenious solutions, including floating UI windows, HUDs (heads up displays), and viewer overlays. Chromatic uses all of these approaches. The Chromatic toolset includes nine correction effects, which can be stacked in any order onto a clip. These include lift/gamma/gain sliders, lows/mids/highs color wheels, auto white balance, replace color, color balance/temperature/exposure/saturation, three types of curves (RGB, HSL, and Lab), and finally, color LUTs. As you use more tools on a clip, these will stack into the floating window like layers. Click on any of these tools within the window to access those specific controls. 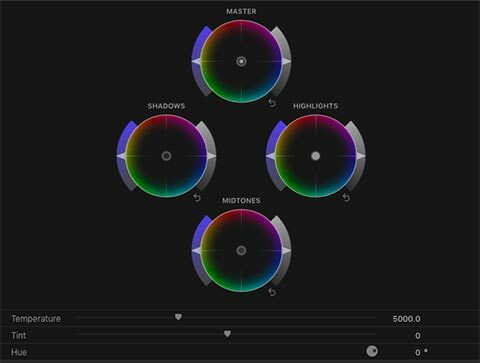 Drag tools up or down in this window to rearrange the order of operation of Chromatic’s color correction processes. 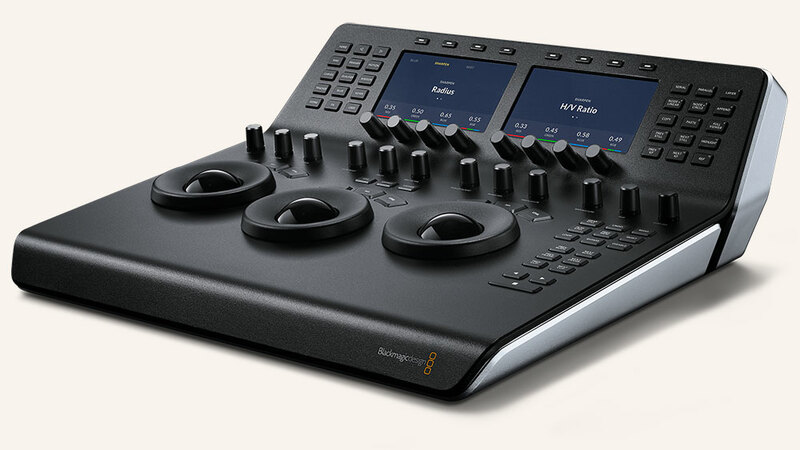 The specific controls work and look a lot like similar functions within DaVinci Resolve. This is especially true of HSL Curves, where you can control Hue vs. Sat or Hue vs. Luma. 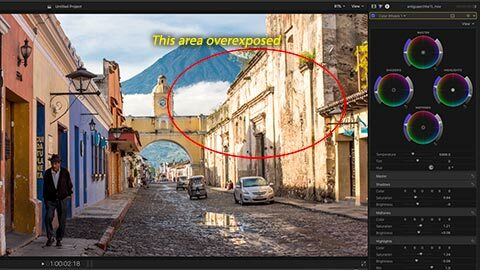 Corrections can be masked, in order to effect only specific regions of the image. If you select “overall”, then your correction will affect the entire image. But is you select “inside” or “outside” of the mask, then you can grade regions of the image independent of each other. Take, for example, a common, on-camera interview situation with a darkened face in front of a brightly exposed exterior window. Once you mask around the face, you can then apply different correction tools and values to the face, as opposed to the background window. Plus, you can still apply an overall grade to the image, as well as final output adjustment tweaks with the sliders in the inspector window. That’s a total of four processes, with a number of correction tools used in each process. To provide masking, Coremelt has leveraged its other products, SliceX and TrackX. Chromatic uses the same licensed Mocha planar tracker for fast, excellent mask tracking. In our face example, should the talent move around within the frame, then simply use the tracker controls in the masking HUD to track the talent’s movement within the shot. Once tracked, the mask is locked onto the face. When you purchase Chromatic, you’ll also get a LUT (color look-up table) browser and a default collection of looks. (More looks may be purchased from Coremelt.) The LUT browser is accessible within the grading window. I’m not a huge fan of LUTs, as these are most often a very subjective approach to a scene that simply doesn’t work with all footage equally well. All “bleach bypass” looks are not equal. Chromatic’s LUT browser also enables access to any other LUTs you might have installed on your system, regardless of where they came from, as long as they are in the .cube format. LUTs get even more confusing with camera profiles, which are designed to expand flat-looking, log-encoded camera files into colorful Rec709 video. Under the best of circumstances these are mathematically correct LUTs developed by the camera manufacturer. These work as an inverse of the color transforms applied as the image is recorded. But in many cases, commonly available camera profile LUTs don’t come from the manufacturers themselves, but are actually reverse-engineered to function closely to the manufacturer’s own LUT. 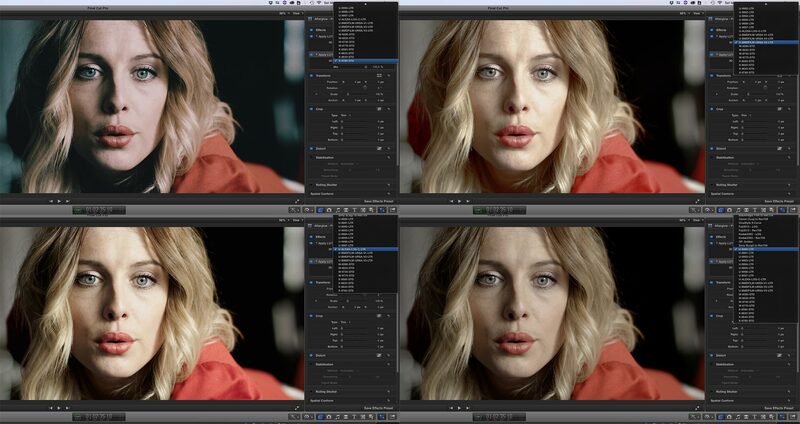 They will look good, but might not yield identical results to a true camera LUT. In the case of FCPX, Apple has built in a number of licensed camera manufacturer LUTs for specific brands. These are usually auto-detected and applied to the footage without appearing as an effect in the inspector. So, for instance, with ARRI Alexa footage that was recorded as Log-C, FCPX automatically adds a LogC-to-Rec709 LUT. However, if you disable that and then subsequently add Chromatic’s LogC-to-Rec709 LUT, you’ll see quite a bit of difference in gamma levels. Apple actually uses two of these LUTs – a 2D and a 3D cube LUT. Current Alexa footage defaults to the 3D LUT, but if you change the inspector pulldown to the regular LogC LUT, you’ll see similar gamma levels to what Chromatic’s LUT shows. I’m not sure if the differences are because the LUT isn’t correct, or whether it’s an issue of where, within the color pipeline, the LUT is being inserted. My recommendation is to stick with the FCPX default camera profile LUTs and then use the Chromatic LUTs for creative looks. Chromatic is a 1.0 product and it’s not without some birthing issues. One that manifested itself is a clamping issue with 2013 Mac Pros. Apparently this depends on which model of AMD D-series GPU your machine has. On some machines with the D-500 chips, video will clamp at 0 and 100, regardless of whether or not clamping has been enabled in the plug-in. Coremelt is working on a fix, so contact them for support if you have this or other issues. Overall, Chromatic is well-behaved as custom plug-ins go. Performance is good and rendering is fast. Remember that each tool you use on a clip is like adding an additional effects filters. Using all nine tools on a clip is like applying nine effects filters. Performance will depend on a lot of circumstances. For example, if you are working with 4K footage playing back from a fast NAS storage system, then it will take only a few applied tools before you start impacting performance. However, 1080p local media on a fast machine is much more forgiving, with very little performance impact during standard grading using a number of applied tools. Coremelt has put a lot of work into Chromatic. To date, it’s the most comprehensive grading toolset available within Final Cut Pro X. 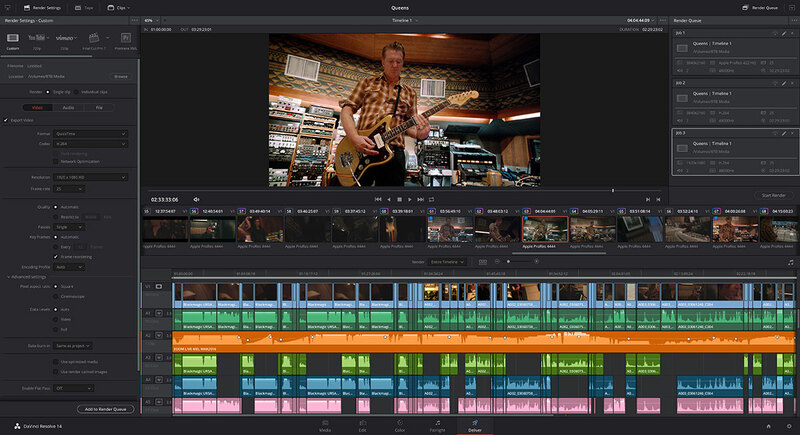 It is like having a complete grading suite right inside of the Final Cut timeline. 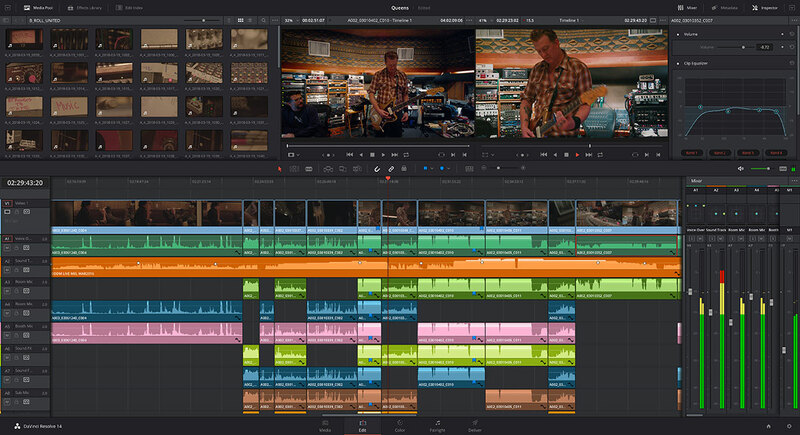 If you are serious about grading within the application and avoiding a roundtrip through DaVinci Resolve, then Chromatic is an essential plug-in tool to have. With more cameras shooting in some form of a log or flat color profile and more editing software being able to integrate color look-up tables (LUTs), numerous developers have designed their own LUT packages. 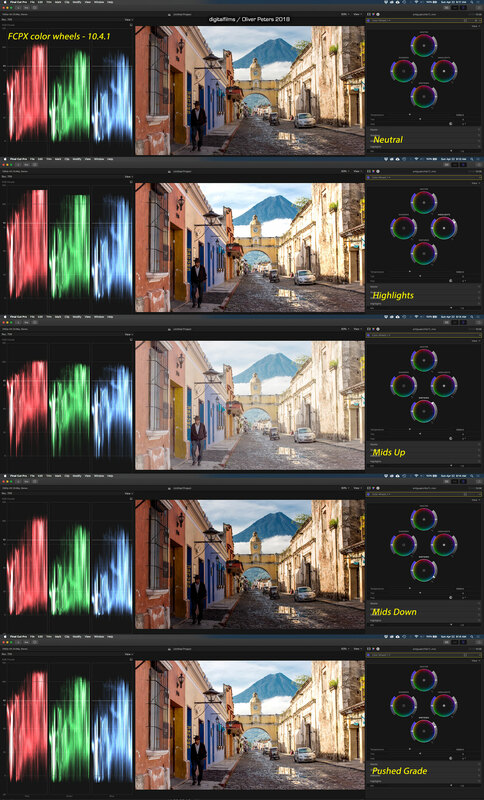 Some, like Koji, strive to duplicate the colorimetry of certain film stocks, while others, such as SpeedLooks from LookLabs, create stylized “look” files that give you a range of creative color correction choices. 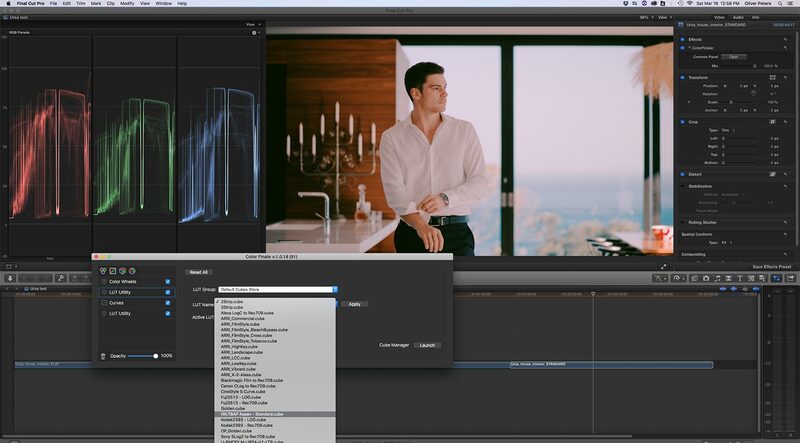 One new developer offering a package of easy to use LUTs is French filmmaker IWLTBAP. Through the website, you can pick up a comprehensive package of LUTs in the 32x32x32 .cube format, which are compatible with most modern editing and compositing software applications. If you edit in Adobe Premiere Pro CC, the Lumetri Color panel lets you browse and add any .cube LUTs you’ve saved on your hard drives. If you cut in Apple Final Cut Pro X, then the addition of a LUT plug-in, like Color Grading Central’s LUT Utility, enables you to add third-party LUTs to any clip on the timeline. I took these LUTs for a spin and like most LUT packages, they come in a groups. First you have Utility LUTs, which are designed to convert color spaces from log to Rec709 (the standard video color space) or in the opposite direction. These are organized by camera type, since not all manufacturers use the same logarithmic values. 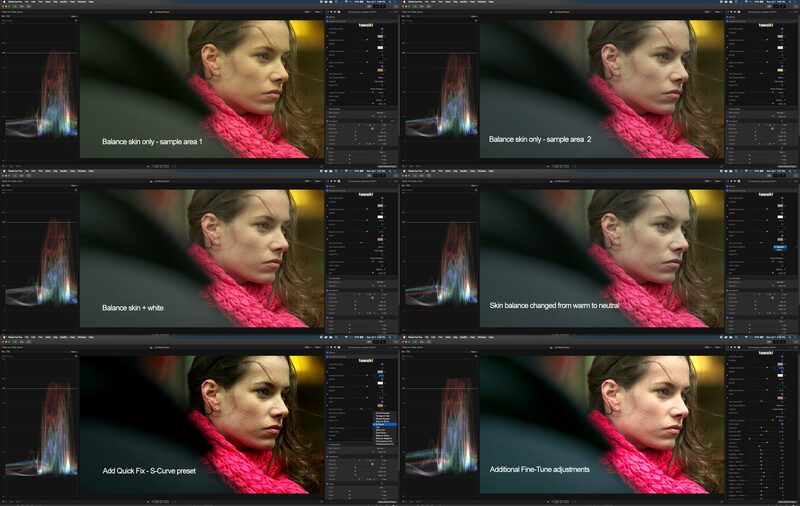 Then the color correction or “look” LUTs are grouped into Standard and Log versions. The Standard LUTs are to be applied to images that are already in Rec709 color space, while the Log versions can be used as a one-step LUT to be applied to generic log images. For example, you could apply both a Log-to-Rec709 Utility LUT and a second LUT from the Standard group to achieve your result. Or simply apply the single Log version to that same clip and end up with similar results. The dual-LUT approach gives you more incremental control over the Log conversion based on camera models, whereas the single-step solution is designed for generic log images. However, both can yield the desired grade, depending on the clip. In addition to the paid LUT package, IWLTBAP offers two Bonus LUTs, which are available as a free download from the website. There are over 80 LUTs in each group and these are organized by color style and number. The numbers don’t really mean anything. In other words, they aren’t an attempt to mimic a film stock number. As you ascend in numbers, the next step is a more aggressive or somewhat different version of the previous. The key is the prefix and suffix for each. These LUT files carry a STD or LOG suffix so you know whether these are from the Log or Standard group. Then there’s a prefix: C for cold, H for hot, W for warm, F for film, and X for creative. Each style has several variations within that general look. 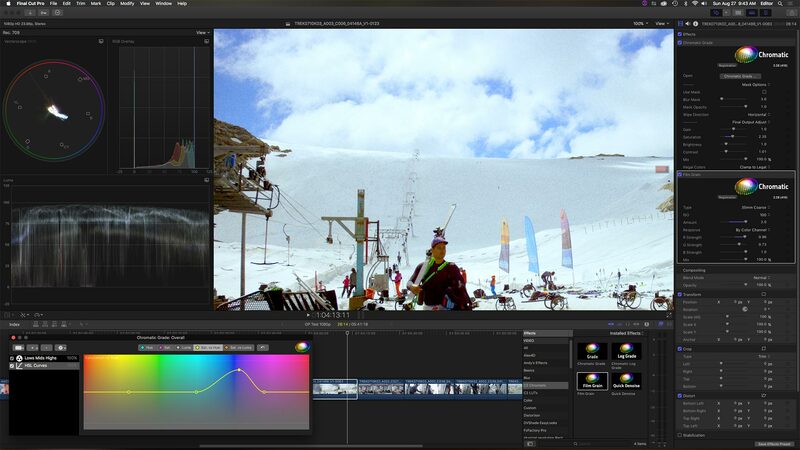 For example, the LUT file labelled “F-9490-STD.cube” is a LUT with a filmic curve designed for a Rec709 image. When working with LUTs, it’s often hard to know what result you get until you try it. Then if you don’t like the look, you have to continue to slowly browse through your LUT files – applying each, one at a time – until you get the right look. Often that can lead to a lot of trial and error. The IWLTBAP package ships with lightweight Windows and Mac preview applications, however, the developer warns of some occasional instability on some machines. The easiest solution is to use their web-based LUT previewer. Simply upload a reference JPEG from your clip and then toggle through the LUTs to preview how those will affect the shot. I ran some tests on Blackmagic Design camera footage in both FCPX and Premiere Pro CC and got some really pleasing results. In the case of FCPX, if you use LUT Utility, you have to copy the .cube files into LUT Utility’s Motion Templates folder. This is found under Effects/CGC. Files stored there become visible in the LUT Utility pulldown menu. Note that only the first 50 or so files in that folder can be accessed, so be selective. If you apply two instances of the LUT Utility to a clip, then you can apply a Log-to-Rec709 conversion in the first and then the creative look LUT in the second. This plug-in has a mix slider, so you can adjust the intensity of the LUT to taste. As an effects plug-in, you can also place other effects, such as color correction in-between the two LUT Utility effects as part of that stack of effects. 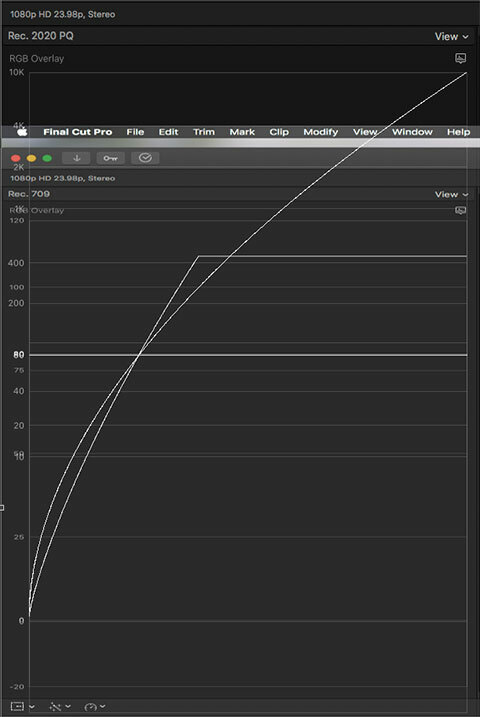 Doing this gives you nice control over color within FCPX with very little overhead on the application’s performance. 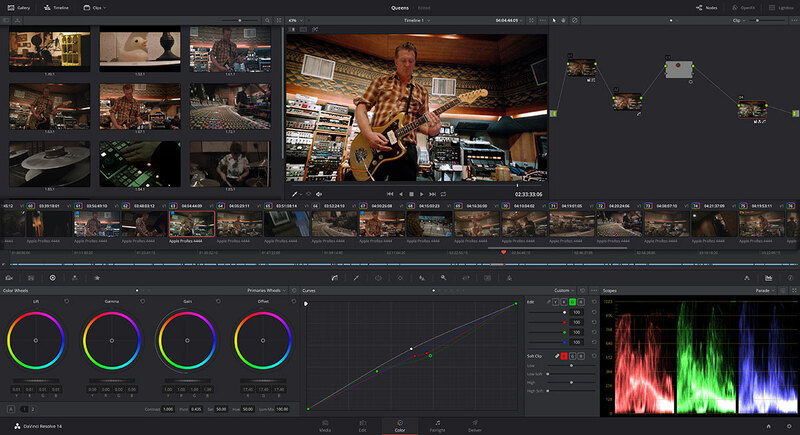 If you are an FCPX user that has adopted Color Grading Central’s ColorFinale grading tool as your go-to color correction plug-in, then all of this LUT management within the application can be simply handled from the ColorFinale interface itself. 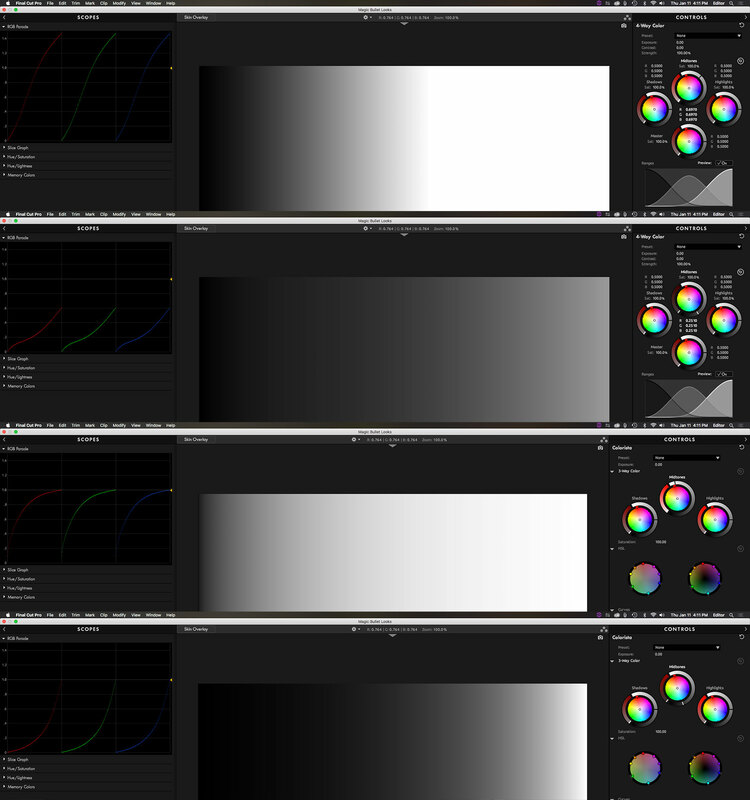 Stack layers of LUTs and other color tools all inside the ColorFinale panel. LUT choices can be added or removed using the integrated LUT Manager and then relaunching FCPX to activate them as part of ColorFinale. 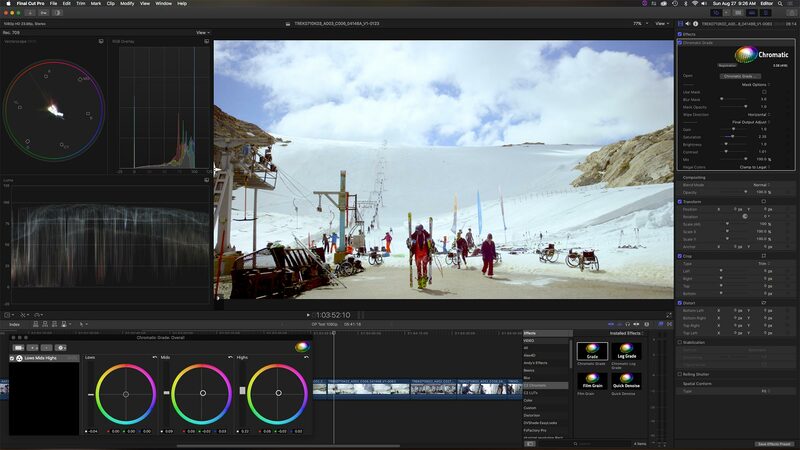 If you are a Premiere Pro CC editor, then the latest version was enhanced with the Lumetri Color panel. 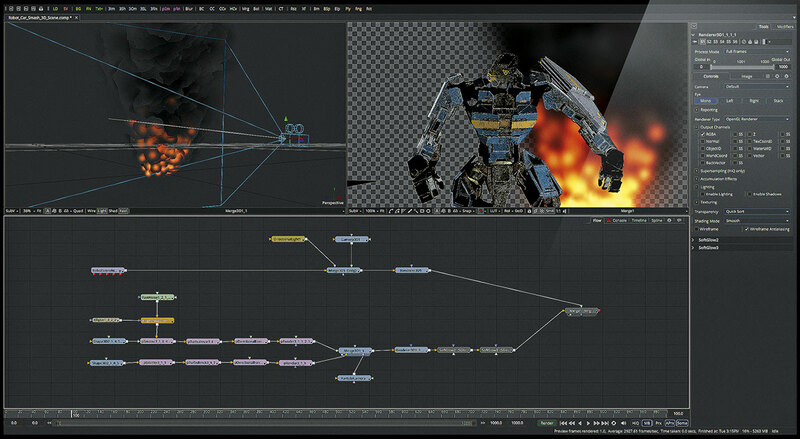 This control is organized as a stack of color modules, which include two entry points to add a LUT – in the Basic and the Creative tabs. In my testing of the new URSA footage, I applied a Log-to-Rec709 LUT for the URSA in Basic and then one the “look” LUTs, like the free Aspen standard version, in Creative. You still have all the other color control in the Lumetri panel to fine-tune these, including the intensity level of the LUT. 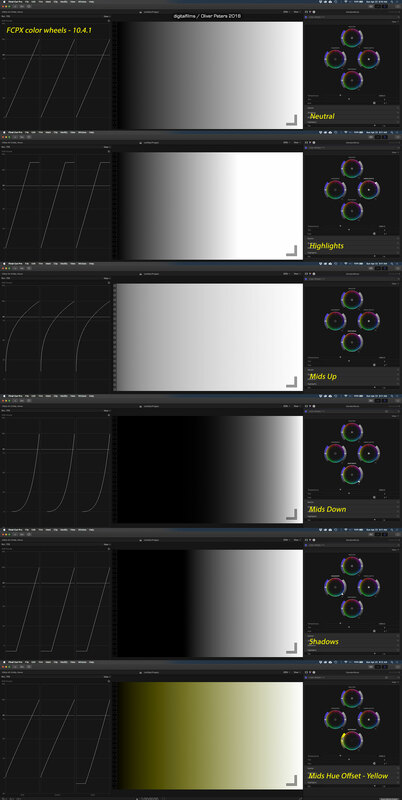 LUTs are a creative tool that should be thought of as a stylistic choice. They aren’t an instant fix and shouldn’t be the only tool you use to color correct a clip. However, the LUTs from IWLTBAP provide a good selection of looks and moods that work well with a wide range of shots. Plus the package is very affordable and even more so if you get it after reading this blog! Readers who are interested can get 25% off of the retail price using the discount code DIGITALFILMS. Or by using this direct link. Last but not least, check out the free, downloadable 4K film grain clip. 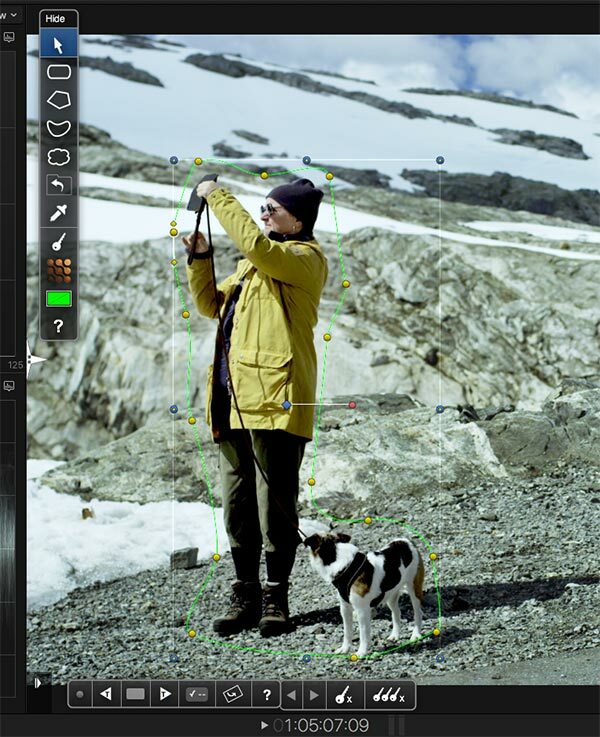 It’s a ten second ProRes file that can be overlaid or blended to add grain to your shot.